UMATILLA, OR -- As the court-ordered increased spill of water started over McNary Dam, electricity production dropped from two-thirds down to a quarter of capacity. The 1,000 megawatt plant was producing just 275 megawatts of electricity, according to Army Corps of Engineer officials who met with Rep. Dan Newhouse, R-Wash., in late April. "There was enough water to produce the full 1,000 megawatts," said Lt. Col. Damon Delarosa, commander of the Corps Walla Walla District. But because of a U.S. District Court order, more water is required to be spilled over the dam, preventing it from being used for generating electricity each spring starting this year. Since the start of the increased spill -- April 3 on the Corps' four Lower Snake River dams and April 10 on its four lower Columbia River dams -- more snow is melting in the mountains and more water is rushing down the rivers. 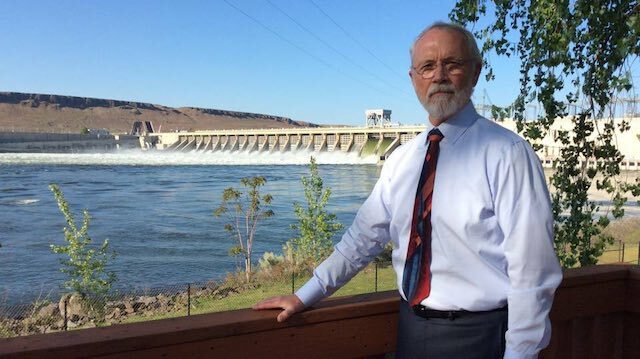 "I see wasted water," Newhouse said as he watched water spill over the McNary Dam. "There are some things we are already experiencing -- the lost power generation, lost dollars, lost economic benefit." More water spilled over the dams means more gases in the water -- including oxygen, carbon dioxide and nitrogen. Young fish can suffer fatal symptoms form the gas, similar to when human divers get the "bends."